Home > Emergency Supplies > Emergency Tools & Supplies > Earthquake Preparedness Supplies > QuakeHold! Clear Museum Gel for Glass & Crystal - 4 oz. Home > Earthquake Preparedness Supplies > QuakeHold! Clear Museum Gel for Glass & Crystal - 4 oz. 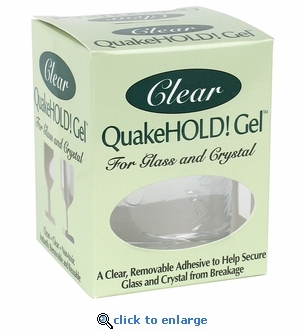 Quakehold Clear Museum Gel will protect your glass and crystal collectibles from toppling in the event of an earthquake. Primarily designed for glass-on-glass applications, QuakeHold Gel can be used on most smooth surfaces. It’s easy to use, just scoop a little out of the jar and roll it into balls. Place on the bottom of an object, press down lightly and twist into position. The gel gradually flows across the base of an item until it creates a superior invisible bond. The gel is designed for use on flat, level surfaces only and takes up to an hour to set properly. Our 4 oz. jar is enough to secure up to 300 items of average size.